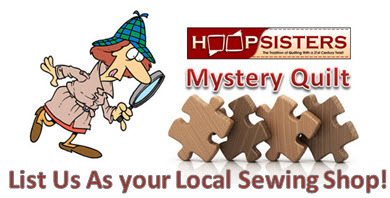 you can participate in the 2013 HoopSisters Mystery Quilt! Only $69, or $89 for optional border & CD,in the month of June. After that you’d have to purchase $240.00 worth of CD’s to create this beautiful quilt layout. Mark your calendar for June 2013! 1.) Visit www.hoopsisters.com and download the 2013 Mystery Quilt in the month of June. 2.) List your local sewing shop (QUILTZ) as your HoopSisters Dealer in your Account Details. 3.) Receive an email a week for 6 weeks with more of the design and instruction! There is not a special class that is meeting at Quiltz but for those that are in Feathered Star - We will be talking about it in the May, June and July Classes. Jennifer is doing the mystery too!! !